In October, when the first frost settles over the hills and the leaves begin their brilliant decline, the calendar naturally turns to a commemoration of death. Halloween, or All Hallow’s Eve, is by tradition a time to remember the dead. As such, the month provides a fitting opportunity to visit area cemeteries to honor the lives of loved ones lost or to simply appreciate the memorials of those who have lived before us. Historic Ithaca is a steward of the Ithaca City Cemetery through its affiliated organization, the Friends of the Ithaca City Cemetery (FICC). To draw attention to the need to preserve the city’s 16-acre municipal cemetery, FICC sponsors guided history tours of the cemetery in October. On a recent tour, participants noticed the finely etched carving on a native bluestone monument more than 200 years old. Several pointed out unusual family names and wondered at the possible genealogical connections. Many were surprised at the stories of the Underground Railroad preserved in stone. Others simply appreciated the beauty of the monuments and symbols carved in stone. To bring more community members to enjoy and appreciate this greenspace, the FICC group also organizes the annual Cemetery Sprint. This light-hearted fun run brings costumed participants to traverse the pathways of the cemetery’s hilly terrain. After all, as the National Trust for Historic Preservation recommends, one of the ways to help preserve a historic cemetery is to host visitor-friendly activities that draw attention to ongoing preservation efforts. The cemetery—as walkers, runners, and bird watchers already recognize—is a vibrant space for the living as well as repose for the dead. It’s vital—and challenging, given strained budgets and ongoing maintenance costs—to preserve area cemeteries as part of our cultural heritage. The very landscape of the Ithaca City Cemetery itself, for example, preserves a history of national trends in cemetery design from a more informal burial ground to a landscaped “garden of the dead.” Group burial plots, including those of the Sons of Israel, Independent Order of the Odd Fellows, and the Grand Army of the Republic preserve the history of local institutions and connect local history to national trends. Names and birth and death dates on gravestones document genealogical history. They point both to the stories of prominent families and to residents who lived quiet but no less extraordinary lives. Even the changes in gravestone type and design have a story to tell about changes in transportation and views of death. If you haven’t visited a cemetery lately, take advantage of guided tours offered or simply drop in and wander the pathways of your nearest burial ground. Note the old-fashioned names that are no longer common, the incised and carved symbols that stand for love, mourning, and death. You’ll begin to appreciate the rich history documented in stone that is our heritage to preserve. For more information about Historic Ithaca’s Ithaca City Cemetery events, visit http://www.historicithaca.org/. 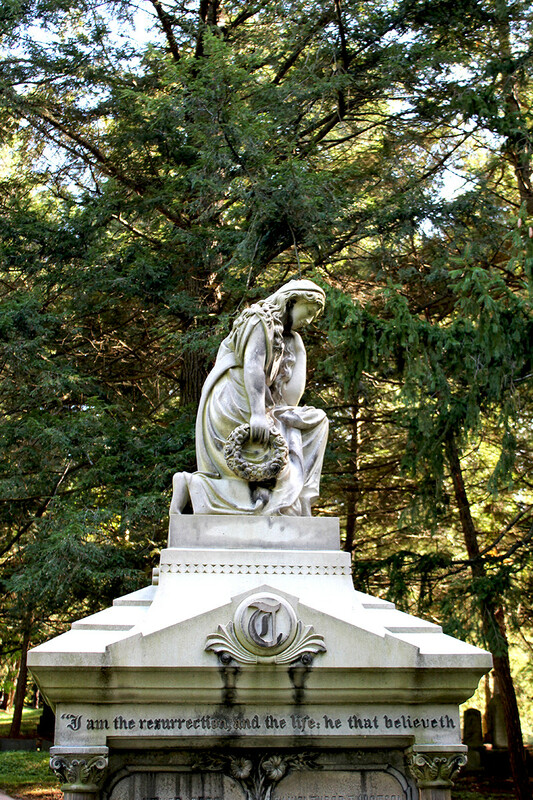 The Association for Gravestone Studies (https://www.gravestonestudies.org/) provides helpful information to those interested in learning more about cemetery history. In 2001, I moved to Ithaca with my husband, our two-year-old son, and a baby on the way. After many years in L.A., we were ready to come back to the East Coast where we’d grown up, to be closer to family, and so our kids could experience the seasons. Cliched but true. Of course, there are seasons in L.A., but it’s just not the same. I had worked in the movie business in NYC for a few years, and then a dozen more in L.A., followed by a few years at KCRW, a National Public Radio affiliate in Santa Monica, where I produced, along with two other shows, a weekly live program called “Hollywood Wrap” that focused on the movers and shakers of L.A.’s ruling industry. There was no better job in the universe, I felt, than working at KCRW. Having grown up in Montreal, I was excited to come back to the East Coast and be closer to my native land. But when my husband announced that he’d been admitted to Cornell for grad school and wanted to go, I was a bit wary. Cornell? Where exactly is Ithaca, anyway, and what’s it near? I whined. He put forth that both Rochester and Syracuse were not so far away. No, no, I said. What real cities is Ithaca near? You know I’m an urban creature, right? I like dirty streets, crowded cafes, bookshops. We packed up and headed east. Well, six months after moving to Central New York, aka the Southern Tier, aka The Finger Lakes Region, aka Upstate, I found out, through my husband (who found out through his Landscape Architecture prof Rick Manning, who I now work with) that Ithaca had a movie history. What?! Really?! Both a history major in college and a cinephile, I was immediately intrigued and set out to find out more. Sure enough, I found out that Ithaca was the home of a bustling silent motion picture studio between 1914 and 1919. Theodore “Ted” Wharton had come to Ithaca in 1912, sent by the Chicago-based Essanay Film Co., to shoot scenes of typical college life at Cornell. He was smitten, like I was—like so many people are today—by the scenic beauty in Ithaca and its environs, and the fact that Ithaca offers a lifestyle that sweetly mixes the rustic and the urban. As a filmmaker, Ted Wharton saw in the region a lot of potential to make movies—he could shoot scenes in the gorges, or on the lake, but then just minutes away was the city itself for more urban backdrops. Wharton returned in 1914, was joined by his brother Leopold shortly thereafter, and they leased 45 acres of what was then Renwick Park, now Stewart Park, and created Wharton, Inc. Studios. During its heyday, the Whartons attracted some of the best-known actors of the day to their studio, people such as Pearl White, Irene Castle, Lionel Barrymore, and a young Oliver Hardy. The Whartons directed and produced dramas, comedies, mysteries, and WWI propaganda films but were best known for their popular serials. Moviegoers would flock to one of Ithaca’s seven downtown movie theatres to see the next episode of Beatrice Fairfax, Patria, or Romance of Elaine. The Whartons embraced Ithaca and Ithaca embraced them back. The studio hired locals as set builders, costume designers, and cinematographers. The newspapers of the day were filled with the comings and goings of the film stars. The Whartons were pioneers in an emerging art form and industry. They made it up as they went along and this must have been awfully exciting. There was no question in my mind: this unique and fascinating local Ithaca history needed to be exploited, in the best sense of the word. Maybe there could be a museum, or at least some sort of homage paid to these entrepreneurs, these artists. And, when I found out that the original motion picture studio was still standing in Stewart Park, well, that put me over the edge! 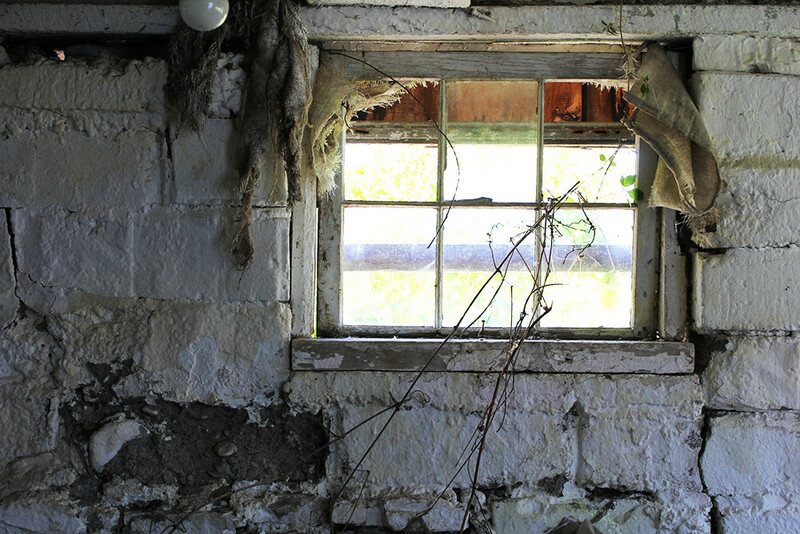 As the daughter of a developer—one who loves historic preservation—I saw the potential to preserve and celebrate this history, broaden awareness of the Whartons and the role Ithaca played in early American filmmaking, and bring this historic building by the shores of beautiful Cayuga Lake—one of only a handful of movie production studios still standing in the country—back to life. Almost ten years later, there is much progress and lots to celebrate. It’s been a long road, but an exciting and challenging one. It’s afforded me the opportunity to meet and work with so many incredible people. Wharton Studio Museum (WSM), the nonprofit I co-founded in 2009, produces year-round programming and exhibits; hosts a film festival for youth; puts on a free screening of a silent film with live music every summer at Taughannock Falls State Park; is developing plans for a Central New York Film Trail; offers a self-guided tour of silent film locations; and, in the spring of 2019, will have a permanent exhibit in the new Tompkins Center for History and Culture, in collaboration with a plethora of wonderful organizations—Historic Ithaca, Community Arts Partnership, Dorothy Cotton Institute, The History Center, and Ithaca Aviation Heritage Foundation. History is happening in New York—to quote from Hamilton—and it’s exciting and rewarding to discover it, preserve it, celebrate it, and revel in it. Ithaca with initiatives like Ithaca Heritage does a swell job of this, with much wonderful support from local government grants and a supportive and generous community that loves and appreciates history. In 2012, WSM proposed to Mayor Myrick that October be officially proclaimed Silent Movie Month in Ithaca. We chose October believing the Whartons signed their original lease in the park in October, or that Theodore Wharton first visited Ithaca in October of 191—I can’t recall. The City agreed to the proclamation and on a lovely spring afternoon, the mayor signed it outside the Wharton Studio building. Seven years later Wharton Studio Museum and we, the denizens of Ithaca, are celebrating Silent Movie Month with screenings, a photo exhibit at a pop-up gallery, presentations, and an operetta based on a 1916 Wharton serial. Cornell Cinema, Cinemapolis, The Cherry Artspace, Tompkins County Public Library, and Ithaca Made Movies are all taking part. I hope you will, too. Celebrate Silent Movie Month with us—we invite you to attend an event this October and make noise about silent film! Just like the Whartons did one hundred years ago. They did not have a website, but we do: www.whartonstudiomuseum.org. Farming has always been a major land use in our county, starting with the Haudenosaunee. After the Revolutionary War, when non-native settlers moved in, the landscape changed dramatically as land was cleared--trees were used for construction, often sent to cities, and open land was planted to crops. In 1875, 297,376 acres out of 314,240 total acres in our county were farmed! At that time, farms were small and spread throughout the landscape. Most had diverse operations, with a few cows, pigs, chickens, sheep, and horses and with crops raised to feed the livestock and the people. Over time, people left the agrarian lifestyle, as opportunities for employment in factories and cities arose, contributing to a steady loss of farms, especially from hilly, less productive sites. In 1875, there were 3,392 farms, and by 1945, the number had been cut in half. Loss of farms was further accelerated after World War II as production efficiency improved (bigger machinery) and highways opened up the flow of food from the West. In the early days, agriculture was ALL LOCAL: diverse farms raised a variety of products for their families and for sale in their community. By the 1950s, farms had become bigger and more specialized. Retailers began buying products from distant sources at lower prices, squeezing out local farmers. Production for export markets became the push in the 1970s as U.S. farmers were urged to feed the world. While there are fewer farms, the amount of acreage in farming in our county has not changed as drastically. Today about 1/3 of the county land area is still owned or operated by farms. Agriculture is still a significant land use. Currently we have about 100 full-time farms and about 450 small part-time farms. Small, diverse farms are making a comeback. Tompkins County is home to a robust local foods movement that started in 1973 with the creation of the Ithaca Farmers’ Market. Since the 1990s, it was kicked up a notch, with the advent of CSAs--Community Supported Agriculture farms, where you buy your produce at the outset of the season and get a weekly harvest share. Now, farm-to-consumer direct marketing is widespread; there are more than 400 direct-market farms in a 30-mile radius of Ithaca. And you can buy most any product year round. Agriculture has come full circle, to include a healthy mix of small, diverse direct-market farms, along with medium-sized farms that use land for dairy production that is exported to regional milk processing plants. This mix contributes to a healthy agricultural economy in which farmers maintain land in active agricultural production, create jobs on farms, and pay local taxes, and loyal local food shoppers help small farms thrive. Enjoy visiting Tompkins County farms and hearing about their stories during Ithaca Heritage’s Authentically Rural Weekend, October 5-7, 2018. On Saturday, October 6, explore working farms in Freeville during the Authentically Rural Farm & Village guided bus tour (9:00 a.m. to 12:00 p.m.; $35) and learn the story of a heritage homestead during the Tompkins County Rural Heritage guided bus tour (1:00 p.m. to 4:15 p.m.; $35). Stroll the grounds of Maryhill Farm and enjoy a catered brunch while learning the history of this Schickel family farm on Sunday, October 7 (10:00 am-1:00 p.m.; $25). For more information about the weekend’s events celebrating Tompkins County’s rural heritage, go to http://www.ithacaheritage.com/authentically-rural-weekend/. When Ithaca Heritage partners first started planning the Authentically Rural Weekend (October 5-7, 2018), we had to think about what makes Tompkins County’s rural heritage distinctive and attractive to residents and visitors alike. Part of what makes Tompkins County distinctive is the continued vitality of rural areas with their own identities quite separate from the county seat of Ithaca. Trumansburg, Enfield, Newfield, Danby, Caroline, Lansing, Groton, Dryden—all of these are unique towns with their own identities that haven’t just become bedroom communities for Ithaca. Luckily we have a rich tradition of local historians and writers who have documented these rural communities. One of those writers is Amy Dickinson, whose Mighty Queens of Freeville (2009) captures the complexities of small-town life in rural Tompkins County. In the book, Dickinson shares her difficult childhood growing up in Freeville and recounts her return as an adult, when she spends summer days with her daughter riding bikes, kayaking, and going “’porch visiting’—setting out from our house on Main Street and spending the day roaming from porch to porch—from grandmother to cousins to sisters to aunts—admiring gardens and drinking iced tea.” Dickinson describes the extended family ties, community traditions, farm-raised produce, and rural landscapes that define Freeville. During the Authentically Rural Weekend, we’ll be exploring Freeville (“The only Freeville in the United States”!). Originally a hamlet known as White’s Mill, the village was a mill hub by the early 1800s and then later a railroad junction. A mix of Greek Revival and Queen Anne homes lines its Main Street. Explore the stories and people behind its historic architecture, along with two of its farms, on the Authentically Rural Farm & Village guided bus tour on Saturday, October 6, 9:00 a.m. to 12:00 p.m. Get your tickets ($35) today: https://tinyurl.com/y8elccrd. For more information about the entire Authentically Rural Weekend of events, go to http://www.ithacaheritage.com/authentically-rural-weekend/. Falconry, also known as hawking, is the sport of hunting with a trained bird of prey, usually a hawk or falcon. Falconry is also an art. It requires long hours, constant devotion, finesse, subtlety, and skill. The falconer must train a bird to fly free, hunt, and then accept a return to captivity. The sport has long been practiced in rural areas of New York State, which requires falconers to have a special hunting license. The New York State Falconry Association, a fraternal organization, promotes falconry and raptor conservation programs. 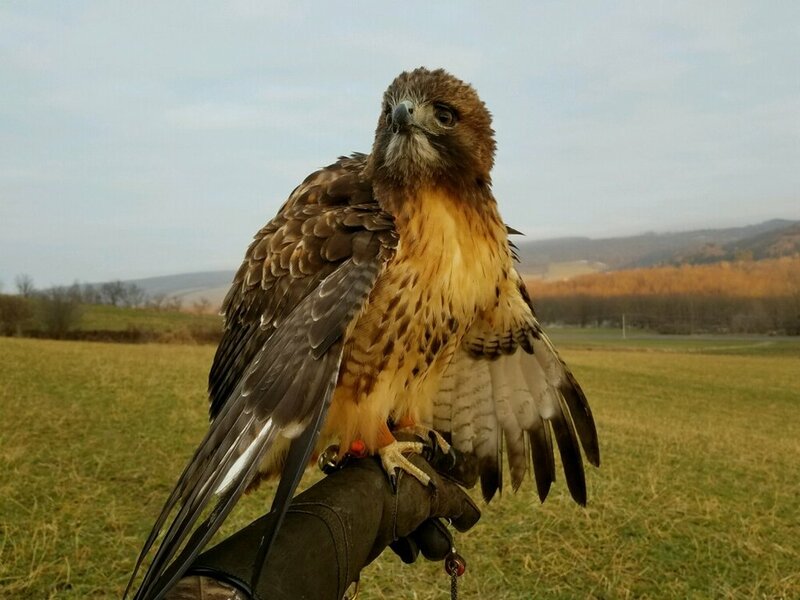 In Tompkins County, the Cornell Raptor Program offers public education programs on the biology and conservation of birds of prey. Local author Rachel Dickinson, a Freeville native, has written Falconer on the Edge: A Man, His Birds, and the Vanishing American West, on a prominent falconer. The Dryden Town Historical Society is pleased to have Claire Kuiken, with her red-tailed hawk Ajax, give a presentation and a demonstration of the art and history of falconry at the Dryden Homestead Heritage Fair Day at the Southworth Homestead in Dryden, on Saturday, October 6th, from 1:00 to 2:30 p.m.
Claire, a senior at Homer High School, began training in falconry as a young teen under the tutelage of her mentor, Peter Harrity. She will discuss aspects of anatomy, evolution, and conservation, as well as the steps necessary to become a falconer. Her presentation will also include the origins of falconry, traditional vocabulary, and the impact on other cultures. Claire will be joined by her father, John, in longer-range flying demonstrations at the end of her talk. Depending on Ajax’s behavior and the crowd, Claire may allow others to hold him (with a glove on) and maybe even fly him! The Cornell Raptor Program will also be on hand at the fair. The Dryden Homestead Heritage Fair Day coincides with Ithaca Heritage’s Authentically Rural Weekend, October 5-7, 2018, celebrating Tompkins County’s rural heritage. Join us for a wine and paired tastings reception, rural heritage tours around Dryden, a harvest dinner, and a homestead brunch. Craft your own rural adventure and purchase tickets to individual events or buy the entire weekend package. For tickets and more information, visit the Authentically Rural Weekend page. Protesters outside of Woolworths on the Commons. 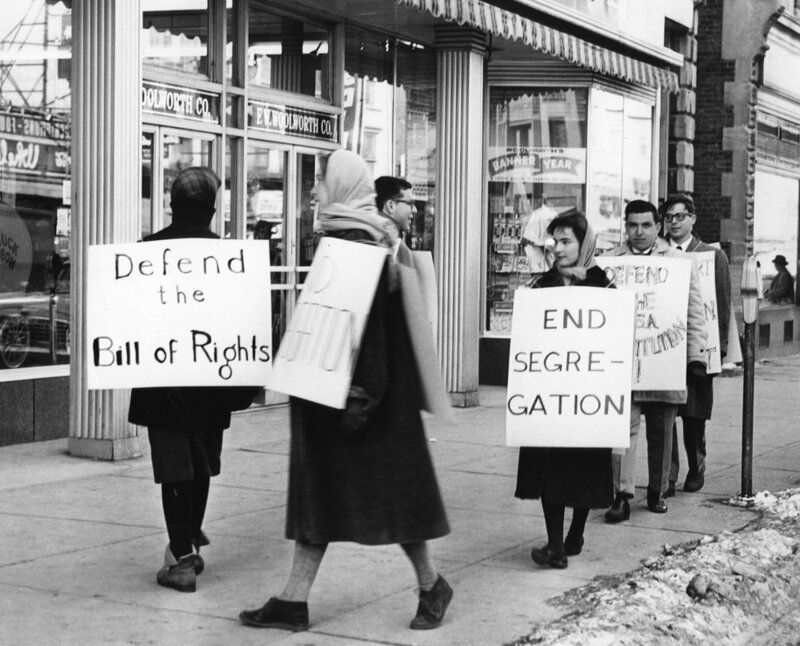 Image from the Photo Collection at The History Center in Tompkins County. The History Center in Tompkins County hosted two lunch-time discussions leading up to this year’s Ithaca Festival. The conversations lined up well with gearing up for the celebration of all that is Ithaca. Ithaca/Tompkins County has the reputation of being an “alternative place.” Ithaca and Tompkins County have historically been involved in social movements. We are actively exploring ways to include those histories in the exhibit hall in the emerging Tompkins Center for History and Culture and in potential Ithaca Heritage tours. These themes lend themselves to working in partnership with other organizations and groups. There is a great deal of material to work with. While there are disagreements about just how alternative we are, most would agree that we have that reputation. While there are other communities throughout the United States that have a similar reputation we have a somewhat unique set of characteristics. We have an interesting combination of landscape and geography, academic institutions, agricultural traditions, and a diverse population that lends itself to social, cultural and entrepreneurial experimentation. We also have been involved in several social movements covering a broad range of issues including racial, social and economic equity; environmental health; voting rights; and marriage equality. There is a likely correlation between our alternative components and active social involvement. Ithaca and Tompkins County are comprised of multiple communities that are dynamic, involved and innovative. We look forward to conveying and highlighting our alternative and social movement histories in the Tompkins Center for History and Culture. Cornetist and band leader Patrick “Patsy” Conway (1865-1929) came to Ithaca from Cortland in the mid-1890s and made an immediate impact on the city’s music scene. His Conway Band gained national fame during the early years of the “Big Band” era in the 1910s and 1920s. The band could be heard at Renwick Park (now Stewart Park) locally, and they toured nationally, even appearing on the General Motors Radio Hour and opening home games for the New York Giants. In the Broadway musical “The Music Man,” Conway’s name is listed with other famous band leaders, including John Philip Sousa. Conway’s influence spread even more widely in the 1920s when he began training band leaders at the Conway Band School housed at the Ithaca Conservatory of Music (now Ithaca College). Area bands continue Patsy Conway’s fine legacy. On Saturday, October 6, 2018, the Dryden Homestead Heritage Fair Day will celebrate Big Band music by featuring three of these bands. Here is a brief description, in their own words, of the bands and an idea of what types of music they offer. The Fall Creek Brass Band’s headwaters are found in the funky beats, groovy bass lines, and hot licks hidden in the hills in the outskirts of Tompkins County. The waters of Fall Creek flow, at times slow and meandering and at times raucous and untethered, carrying this miasma of groove to Ithaca and surrounding towns where it infects the local population with an inescapable need to dance, sing, smile, and laugh. When the party ends, the waters of Fall Creek evaporate to travel back to their hilltop homes to rejuvenate their funk juices for the next party. Originally formed at Dryden High School a decade ago, FCBB has experienced a lot of evolution in that time. Graduation from high school dispersed the band’s original members far and wide and the band played only a handful of times in the past few years. However, a new cadre of Ithaca and Cortland funk masters have joined the band and Fall Creek has found itself reinvigorated with new life. 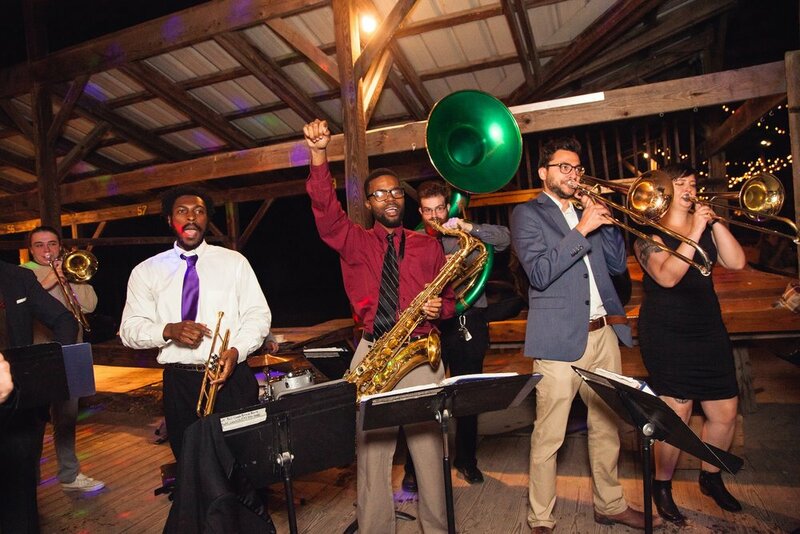 In their inexhaustible effort to get the world up and shaking that groove thing, the Fall Creek Brass Band plays a wide variety of dance music from traditional New Orleans tunes to funk, hip-hop, and rock and roll. Fall Creek can also be heard on their latest album, Prime Time. The Ithaca Concert Band was founded in 1976 by a group of people who realized the community was missing an important part of its musical foundation—a community band. The band was formed with the intention of providing live, quality musical performances at places accessible to all people of Tompkins County and to offer local musicians a challenging and rewarding musical experience in an encouraging environment. To this day, the band carries on its original mission. The Ithaca Concert Band is the area's community band—the official band of the City of Ithaca—and performs free concerts throughout the year at local auditoriums and popular outdoor venues. The Ithaca Concert Band is a popular group, drawing crowds in excess of 300 at its performances on the Ithaca Commons during the summer. The band is also popular with the area's musicians and has had over 500 people who have played with the band over the years. Believe it or not, we have people in the band now who were there when it all began. The Ithaca Concert Band performs selections from the traditional concert band repertoire, which includes light marches and medleys. Their music celebrates Ithaca’s rich history of community bands dating back to the 1920s. The Cortland Old Timers Band was a community band that was reorganized in 1967 by John Discenza and Phil Natoli. Their goal was to provide local musicians with challenging and rewarding musical performance opportunities, and to inspire and entertain the Cortland area community with live band experiences. To this day, the band carries on with its original mission. The band continues to attract both young and seasoned musicians from the Cortland area, which abounds with musical talent and generations of community band heritage. Today, the band boasts approximately 60 volunteer members, ages 14 to 87, who strive to enrich the Cortland-area community and future generations with their passion for live concert band performances. Their concert selections range from traditional marches, overtures, and patriotic songs, to popular Broadway, movie, and folk music selections. Audiences become connected to the band via interesting and whimsical background on the music origins, the band members and supporters, as told by the band’s announcer. Don't miss the opportunity to enjoy all three bands (schedule to be determined) at this year’s Dryden Homestead Heritage Fair Day, which will coincide with the Ithaca Heritage “Authentically Rural Weekend”—October 5th through 7th. The entire weekend promises to be a memorable county-wide celebration of our rural heritage. Dryden's Homestead Heritage Fair Day is made possible in part by a grant from the Tompkins County Tourism Program. I have a very deep connection to Tompkins County. Of particular note is land in Dryden that has been in my family since 1815. Rural-ness is in my bones and embedded in numerous memories. I grew up on a former farm in Lansing just a mile down the road from my Grandma and Grandpa Howe. I had the opportunity to hay with my Grandpa as a teenager and to help Grandma with various tasks. I came to love the cow barn and the horse barn. Every night we would take our small milk can and go up the road to get milk from Grandpa. It is with respect that I now drive around Lansing while acknowledging the various emotions as I look at all the development that has happened in the town over the past 50 years. I am fortunate to still have car time with my mother (age 94), and it seems as if every few minutes she will look out the window and give some reference to a family connection with a home, building, cemetery or landscape. I often say to folks that I know where my people are buried. My father did become a part-time farmer but not on the Howe homestead. Instead, he bought a farm a mile away a few years after returning from service in World War II. When he sold that farm when it proved to be too much with a young family, he bought the place across the road -- a deserted, overgrown farm. When our family used the forty acres at all, it was used for recreational purposes. There are other “chapters” to the story but suffice it to say that now my brother owns most of the land that had been part of the original farm and lives there. Our family gathers there. It is a gift that we can still walk on the land that has been in the family for multiple generations. A few artifacts serve to remind me of my relationship to land and farming. There are still a few guns in the family made by Henry Townley Howe, my great-great-grandfather, and one of the guns is part of The History Center’s collections. I have the milk can that we used every evening. And, in part, because of the two barns I helped to start the NYS Barn Coalition. I have lived in major cities but my early life embedded an appreciation for rural-ness. Of course, as Director of The History Center in Tompkins County, I am delighted that we own and manage the Eight Square Schoolhouse. The schoolhouse, built in 1827 by local carpenter Henry Balcom, is one of Tompkins County's finest local landmarks. It is the earliest school still existing in Tompkins County, and the only brick octagonal schoolhouse left standing in New York State. Used as the Town of Dryden District Number 5 school until 1941, when pupils began attending other schools in Dryden, the building was used for a brief period as a community activity center and as an occasional site for field trips. By the early 1950's the building had been declared surplus property, and it was in 1953 that ownership of the building and its lot were deeded to the DeWitt Historical Society for the sum of $10. The building is on the National Register of Historic Places, and in 2000 it became an Official project of Save America's Treasures. Why eight sides? Read more at: https://thehistorycenter.net/education/eight-square-schoolhouse. I find it very interesting that not too far from the schoolhouse is another octagonal building owned by Strebel Planning Group: http://www.strebelcpa.com/BarnRestoration.html. I think of them as sister buildings and wonder if any of the youth who attended the schoolhouse may have also worked in the barn. Both buildings have received the needed care and attention that allow them to be used today. They also serve to remind us of our agricultural and educational histories. The buildings will be on a Saturday afternoon bus tour as part of the Authentically Rural, October 5-7, weekend: http://www.ithacaheritage.com/authentically-rural-weekend/. Come explore our rural history, architecture, landscapes, and culinary bounty! The Southworth Homestead became the headquarters of the Dryden Town Historical Society in 2012. 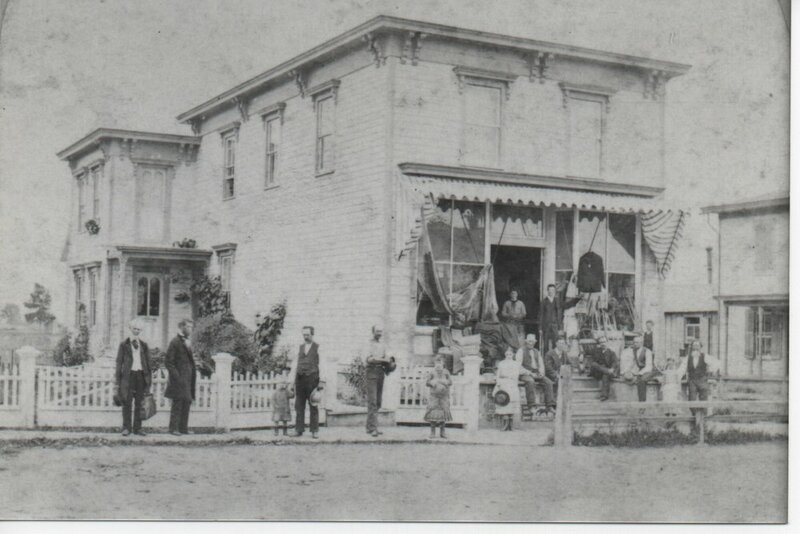 It had been the home of Dryden’s prominent Southworth family since 1836. Rebecca Southworth Simpson, a founding member of the society and the last member of the Southworth family to live in the house, left the property to the society in her will with the stipulation that it continued to be cherished and open to the community. Since that time, we have endeavored to comply with Becky’s wishes, and one of our favorite community events is the annual Homestead Heritage Fair Day. The event has been held in early fall since 2014 and includes activities, demonstrations, and exhibits for the enjoyment of the entire family. Common to each fair has been lively music, children’s toys and games, demonstrations of heritage skills and crafts, animal exhibits, horse and wagon rides, tasty food for sale, and tours of the Southworth House ($5 fee for tours). The 2018 Homestead Heritage Fair Day will be held on Saturday, October 6, from 10 AM to 3 PM on the grounds of the Southworth Homestead, 14 North Street (Rt. 13) in Dryden. This date also commemorates Becky’s Birthday, and the house will be decorated for the party. Come and join the fun! Watch spinners turning sheep’s fleece into yarn or a blacksmith at his forge, take a ride in a horse-drawn wagon, watch demonstrations of dog agility training, sheep shearing, chair caning, cross-stitch, and basketry, see the magnificent birds of prey from Cornell’s Raptor Program, play with toys that your great-grandparents might have enjoyed, listen to the music of the Ithaca Concert Band and the Cortland Old Timers Band, and take a guided tour of the historic Southworth House--Tompkins County’s only historic home open to the public. All this and much more! This year’s fair will coincide with the Ithaca Heritage “Authentically Rural Weekend”--October 5th through 7th--and we are proud to be a part of what promises to be a memorable county-wide celebration of our combined local history. A mix of tradition and innovation. That’s what it takes to keep a family farm going in this era of factory farming, global markets, and development pressures. For two Dryden, New York families, multiple generations are maintaining their agricultural legacy in innovative ways. The Sherman family’s Jerry Dell Farm and Ithaca Organics embraced organic agriculture to survive--and thrive. 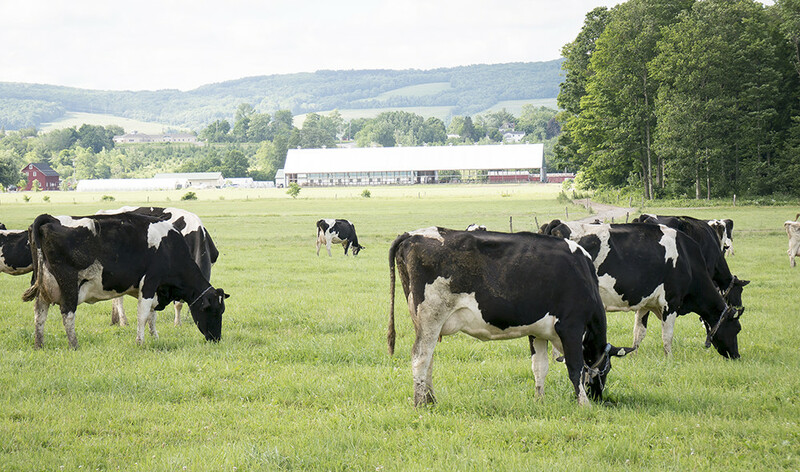 Today the Sherman’s dairy is the largest producer of organic milk in the Northeast. The Shermans rent grazing land from Maryhill Farm, the Schickel family farm established by Norbert and Marion Schickel in 1946—the same year, coincidentally, that Gerald and Ardella Sherman started their Dryden farm. The Schickel siblings—who live all over the United States—run their farm as a family-governed LLC that their mother set up to keep the family’s rural legacy alive. An Airbnb rental is one of the innovative enterprises that helps maintain the farm. Several generations of family members gather annually every summer to maintain their ties to the land. Jerry Dell Farm and Maryhill Farm will be featured during the Ithaca Heritage Authentically Rural Weekend in the Finger Lakes, October 5-7, 2018, which will celebrate the history and current vitality of Tompkins County’s rural life. Enjoy a homestead heritage fair, farm and village tours, a harvest dinner, and a Maryhill Farm brunch as part of the weekend. Check back at the Ithaca Heritage Authentically Rural Weekend event page periodically for more information. Armed with a camera and recorder, I’m spending the summer documenting the folklife of Tompkins County’s fairs and festivals to help The History Center learn more about the place it calls home. Work began in June with three days at the Ithaca Festival. First held in 1977, the festival emerged as a two-week extravaganza that filled the city with sculptures and performance art. Visionary leaders eventually introduced the now-iconic parade, buttons and t-shirts, and spectacles like “Circus Eccentrithaca.” Directors have come and gone. The festival’s grounds have moved. Its schedule has changed. But its claim to “[celebrate] the artist in everyone” has very much remained the same. The idea that everyone has a creative spark worth celebrating is central to the field of folklore. As folklorists generally define it, “folklife” (used interchangeably with “folklore”) expresses the informal shared culture of a group through narrative, material, or customary traditions. That group might be defined by ethnicity, a region, an occupation, a religion, or some other connecting factor. Folklife is learned from family, friends, and community members, not through formal education. Festivals like this one perfectly encapsulate community folklife as participants of all stripes, armed with knowledge instilled by generations of family and friends, band together to do whatever it is that they do. Rather than viewing them as revelations of a single concept of social order, one can more profitably regard them as the traditional enactments of individuals in the community who recognize the focus of energies inherent in recurrent social tensions and conflicts of lifestyle, and who capitalize upon these energies by embodying these otherwise embarrassing nonhousehold ‘nonsense’ behaviors in their licentious festival performances. As former organizers shared with me, not capitalizing “energies” can make parts of the Ithaca Festival look an awful lot like dozens of other regional events. But when participants and organizers with a careful eye makes the most of things, magic happens. Laurel Guy, the festival’s longest-serving director, reflected on one of those special moments during an event held at The History Center last month. Laurel is a gifted, animated storyteller, so I’ll share her words directly. After I said that, I felt an electric current. I don’t know how to tell you this, but we were in a circle, and I felt this current. A charge. And then I never worried about it the rest of the day. Everybody that was part of the festival kept coming up to me going, “Laurel, you need to cancel that circus, because it’s raining!” And I said, “No, it’s going to be okay.” What was also very weird was that we thought we might have 300 people show up. There were thousands of people! We put bleachers up in the ballpark at Stewart Park. And I had my walkie talkie… I was at the ball field, and all the performers were at the boathouse, and there was someone there with a walkie talkie, and we were going to queue them as soon as we could. But we couldn’t, because it was just pouring! And then Dave Davies, who plays trombone, and Frank Campos, who plays trumpet… God knows what caused this to happen. So, why did I do it 10 years? Because when you tune into the spirit of the community in such an intuitive way, there is real magic that can occur and does all the time. It’s all around us all the time. But, literally, we had miracles happen. All the people that were there that day will never forget that. Never. If [Dave and Frank] hadn’t come out to play, I don’t know that the rain would’ve stopped. I’ve included a few snapshots of the magic I witnessed during my own visit to the festival here. Looking at them again, I can’t wait to see what organizers conjure up for next year. If you’d like to share photos or stories about similar observations and experiences at the Ithaca Festival, email Davis at hdavis@nyfolklore.org to include them in this project’s documentation. Davis will also document the Trumansburg Fair and Groton Olde Home Days. At each event, she will join collaborators in a community conversation, during which attendees will be invited to share their own experiences. A culminating public event will be held at The History Center this fall. More information about these events will be made available at www.thehistorycenter.net. “Interpreting Community Folklife at Tompkins County's Fairs and Festivals” is made possible by the New York State Council on the Arts with the support of Governor Andrew M. Cuomo and the New York State Legislature. Davis currently serves as the New York Folklore Society’s upstate regional representative and is a research assistant at the Rochester Institute of Technology. She holds a BA in Folklore and Ethnomusicology from Indiana University and an MA in Folklore from Western Kentucky University. “So enter that thou mayest become more learned; more thoughtful; so depart that daily thou mayest become more useful to they country and to mankind.” This motto, borrowed from the Latin inscription on the gate at the University of Padua, marks the Eddy Gate on the southwestern edge of Cornell University. Today the Eddy Gate leads to a tucked-away parking lot away from the main thoroughfares leading to campus. But the grand gateway was once a vibrant transition space between city and college, with a grand circular drive leading to it and streetcars trundling past. 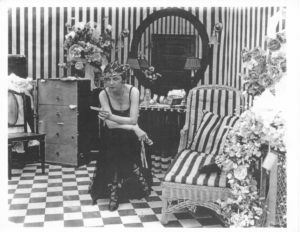 A film studio, Cayuga Pictures, even shot a scene for one of their silent films, "If Women Only Knew," (1920) at the spot. 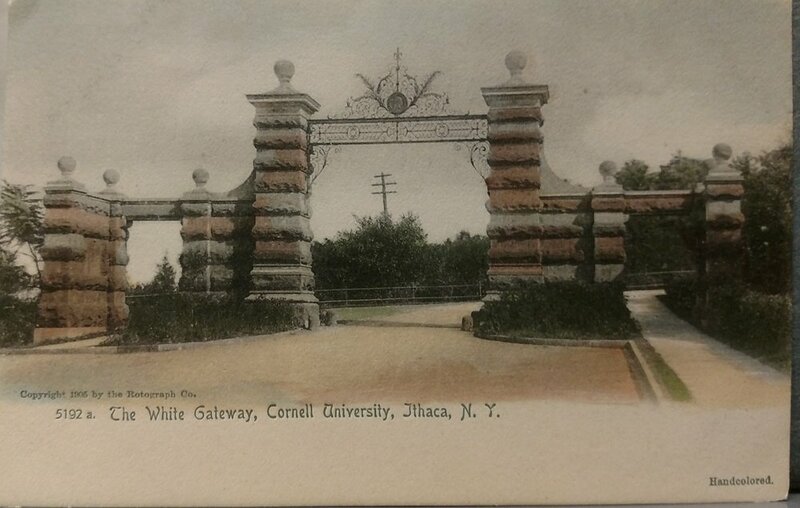 First Cornell president Andrew Dickson White donated funds for the gate’s construction, and it was completed in 1896. Architect William H. Miller designed the gate’s alternating courses of sandstone and limestone. An ornate wrought-iron arch with a medallion of Ezra Cornell spans the top of the gate. It’s formally known as the Andrew Dickson White Memorial Gate, and at one time was informally known as “Andy White’s chocolate layer cake” because the colors of the layered stones resembled a frosted cake in Cornell’s colors. Now this neglected spot is once again receiving attention. Cornell’s Campus Planning Office is partnering with Design Connect, a student-led community design organization, to come up with new uses for the open space adjoining the gateway in what they're calling Project Eddy Gate. From May 4 to May 6, Design Connect will construct a pop-up park in the Eddy Gate alley to welcome the Cornell and larger communities to enjoy the space. Known as “tactical urbanism,” this type of approach encourages engagement with urban areas that have fallen into disuse. The weekend may well spark a renaissance of this historic landmark that connects town and gown. Tompkins County was very involved in the fight for gaining women the right to vote. Dr. Pastorello provides narrative and chronological highlights in this blog. In the spring of 1878 Calista Andrews of McLean, New York, travelled to a meeting of women suffragists in New York City. Making her rail connection in Ithaca, she continued downstate to the Tenth Annual Convention of the New York State Woman Suffrage Association to serve as the delegate representing Tompkins County. Although the details of Callie’s life have yet to be uncovered, examining the world around her suggests the motivations for her suffrage activism. It is almost certain that she knew Dr. Almon Robinson, the town doctor and noted community leader who championed a number of reform causes. People escaping on the Underground Railroad who followed the creek bordering Robinson’s property frequently took refuge with the family before the Civil War ended slavery. In addition to his abolitionist activity, Robinson ardently supported women’s rights. Callie may have attended the Select School for girls that Robinson helped his daughter, Helen, establish. On more than one occasion, Elizabeth Cady Stanton and Lucretia Mott visited McLean to speak in the ballroom of the Robinsons’ large home. As the 1902 “Chronological Summary of Community Events” noted, “the move toward equal rights was strong in McLean.” Calista Andrews’ hometown was one of the many rural upstate towns that became a center for suffrage activism. By the 1890s women throughout the state intensified their quest for political rights. In 1894 the leaders of the state suffrage association decided to hold their annual convention at a university center and chose Ithaca despite its lack of a suffrage organization. Led by New York State Woman Suffrage Association president Jean Brooks Greenleaf of Rochester, convention delegates voted to use more assertive tactics in their campaign for women’s enfranchisement. As the movement coalesced at the state level, suffragists shifted their activism from presenting general petitions to the state legislature in Albany to attempting to influence individual legislators in their home districts. In between convention sessions, Susan B. Anthony and future National American Woman Suffrage Association president, Anna Howard Shaw, tried to organize a local suffrage organization in Ithaca, but “not enough women could be found who were sufficiently interested.” One local suffrage activist however failed to be deterred. Louisa Lord Riley, recently relocated from Orange, New Jersey, established the Women’s Club of Ithaca in 1895. By 1899 the club’s Equal Suffrage Section had evolved into the Political Study Club and held its first meeting at Lucy Calkins’ lakeside home where a number of widows and teachers signed the membership roster. Susan B. Anthony came from Rochester, and Cornell graduate and hospital reformer Harriet May Mills visited from Syracuse to lend encouragement to the nascent organization. Ithaca’s Political Study Club joined numerous prosuffrage organizations in the county, including the Grange, the Woman’s Christian Temperance Union, Daughters of the American Revolution, the Child Study Club, the Campus Club, and the Political Equality League of Sage College. Most importantly, the Political Study Club proved a welcome addition to the expanding network of clubs belonging to the Tompkins County Suffrage Association, including those in rural Groton, East Groton, and Newfield. In 1909, inspired by Hornell suffrage activist Anna Cadogan Etz, women students at Cornell founded a branch of the Collegiate Equal Suffrage League. By the time the New York State Woman Suffrage Association, directed by president Harriet May Mills, assembled for the annual convention in Ithaca in 1911, the suffrage spirit permeated the city. Juanita Breckenridge Bates. Photo Courtesy of The History Center in Tompkins County. The movement continued to gain momentum as it headed toward the first referendum on woman suffrage in New York State. In anticipation of the referendum vote slated for 1915, Ithaca suffrage leaders Juanita Breckenridge Bates and Helen Brewster Owens helped to coordinate the so-called Empire State Campaign. Bates, who had sacrificed her professional career as a Congregationalist minister to marry, remained a committed activist and headed the Tompkins County Woman Suffrage Party from its inception in 1913. Cornell University Math professor Helen Brewster Owens founded the Cornell Suffrage Club for faculty and rose to the position of Sixth District Leader for the New York State Woman Suffrage Association. Bates and Owens worked alongside other local suffragists toward the passage of the 1915 referendum by inviting engaging speakers to the county and conducting suffrage schools in Ithaca that trained women to recruit men to the cause. Miller NAWSA Suffrage Scrapbooks, 1897-1911. Photo Courtesy of the Library of Congress. Karen Pastorello, Karen Pastorello, History Professor, Tompkins Cortland Community College; Trustee, The History Center in Tompkins Country; and co-author of Women Will Vote: Winning Suffrage in New York State. Heritage Ambassador Joe Schill shares tips on doing house history research in Tompkins County. The New York State Regional Economic Development Council’s (REDC) Southern Tier region awarded two grants totaling $1.365 million to The Tompkins Center for History and Culture (TCHC) during award ceremonies in Albany on December 13, 2017. $1,060,000 is from the New York State Council on the Arts (NYSCA) Arts and Cultural Facilities Improvement Program and will be used to develop buildings owned by Tompkins Trust Company on the Ithaca Commons’ bank alley into the Tompkins Center for History and Culture. 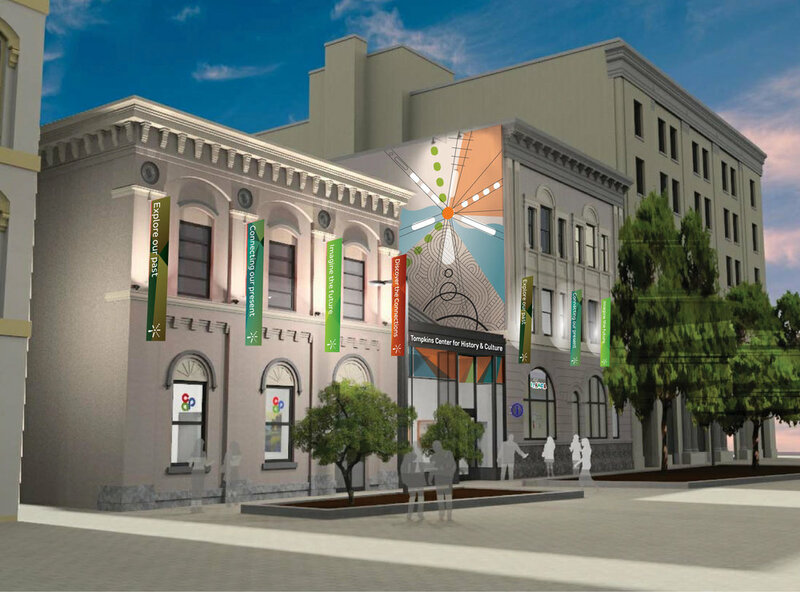 The Tompkins Center for History and Culture will house the CVB’s Downtown Visitors Center (a division of the Tompkins County Chamber of Commerce) and The History Center on the first floor. The Wharton Studio Museum, the Dorothy Cotton Institute, and the Community Arts Partnership will also be integral components of the project. Historic Ithaca and the Discovery Trail will also be affiliated with the Center, and the newly rebuilt “Tommy” bi-plane will be on permanent loan in the exhibit area. Most project partners will also have office space on the second and third floors. Rod Howe, Executive Director, The History Center in Tompkins County, said “Our trustees were looking for a bold and innovative move to better connect people with our local history and culture and with each other to enhance a sense of community and place.” The desire to relocate The History Center spurred this project and won support from the County Legislature. Tompkins County is purchasing the buildings from Tompkins Trust as the Trust Company will be moving to its new building on the 100 block of East Seneca Street. “TCHC is an exciting addition to the Commons and a place where anyone – visitor or resident – can delve deep into the County’s unique history, or use it as a spring board to venture out and about and explore Tompkins County. Wharton Studio Museum is thrilled to be a partner,” said Diana Riesman, Executive Director of the Wharton Studio Museum. Tompkins Trust Company is expected to move to its new headquarters in early spring and code work and reconstruction on the new Center will then begin. STREAM Collaborative is doing the design work, Tessellate Studios is designing the new exhibit area and Iron Design has developed the logo, website and marketing collateral. The Tompkins Center for History and Culture is expected to open in early 2019. Cayuga Lake does not freeze its whole length very often, but when it does, people take advantage of the winter sports enjoyed on the smaller lakes of New York State. There are records of its freezing from Mr. Davenport’s diary of Trumansburg Landing in February 1856, 1868, and 1875. 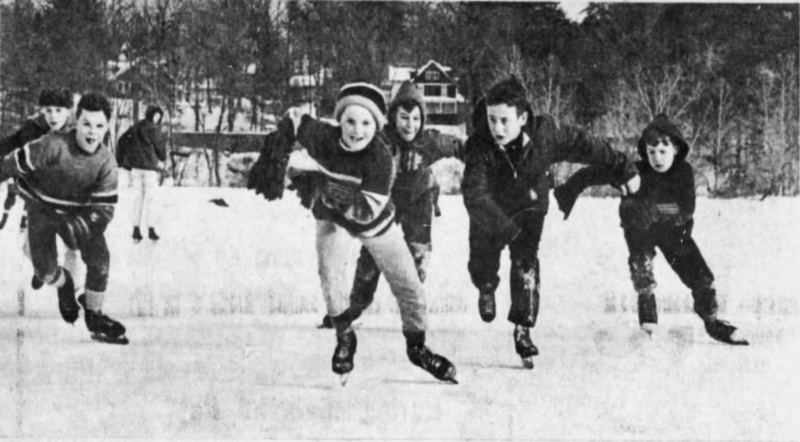 Barbara Bell reported the 1912 freeze in her “Fifty Years Ago” column in the Ithaca Journal. Later years are recorded in Louise Bement’s diary in 1977 when the lake froze from Ithaca to Taughannock; and in 1979 when it froze about all the way (but at Union Springs there was still some open water). In 1912 there were skating contests and parties at Aurora where the ice was the smoothest. 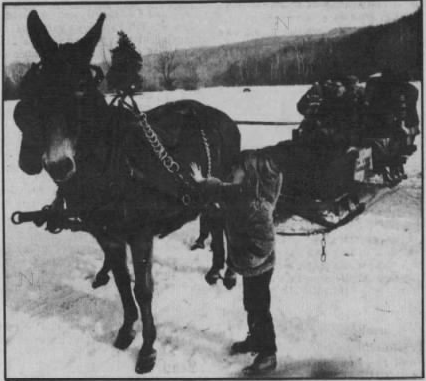 People put chairs on sleds and rode on the ice, and there were horse races. John Townsend, an early Schuyler County car dealer, offered rides in his Maxwell with the top down. He had chains on the rear tires and a bear skin lap robe for passenger comfort. The Illston ice house on West Clinton Street was the longest-running ice house in Ithaca, in operation from 1876 to 1950. An Ithaca Daily Journal ad from may 8, 1897 touts the ice house's artesian well for producing ice "free from any contamination" compared to ice cut from the Inlet or Fall Creek. The lake did not have to freeze completely for ice harvesting to take place. Most years Cayuga Inlet froze, and ice was cut with big saws into huge blocks, which were packed in sawdust and stored in ice houses for year-round sale. There were commercial ice houses near where Dey Street meets Route 13, and smaller ice houses on people’s farms. Farmers would get together and cut the ice, marking off the blocks to be cut with lines scratched into the ice. They would load the ice onto bobsleds and take it to their ice houses. “In 1934 the weather got real cold and went down to minus 35 degrees, so the lake froze over. The first time in my life to have it happen. A good friend of mine, Mike Strek, agreed with me that we should skate from Stewart Park all the way to Lansing Station. We planned to do this during Christmas Vacation and decided to do it on a weekend, thinking we could get a ride back from Lansing Station with my parents. So on a cold Saturday morning we walked to Stewart Park and, by sitting on a log, we put on our skates. It was rough going from the park to Estys as it had snowed a little which had melted, then froze again, which made little ripples in the ice, making it rough. When we approached Estys it smoothed out, as smooth as glass, and we really took off. We thought we were going thirty miles an hour because we were going so fast. Just before getting to Ross’s Point I heard a large crack and slowed my skates to a stop. This caused me to slide out into the water between two large pieces of ice. I did not go all the way into the lake as I stopped myself with my arms, which I spread out on top of the ice. Mike was closer to the shore so he had no trouble. I called him to help me so he found an old dead limb which he slid out to me. Then he pulled me out and I slid to shore. We walked on the shore about a half a mile before we found solid ice. The ducks caused the open water by Ross’s Point by swimming behind the point and not allowing the water to freeze. We started skating again and met my brother, John, with six ducks he had pulled out of the ice on his way up to meet us. We ate a lot of duck for a while. Caesar Grimalkin, a gray tiger cat with seven toes on each white front paw, lived with Celia and William Hazlitt Smith and their two-year-old daughter at 116 Oak Ave. in Ithaca, NY. William was an attorney and Celia was skilled in sewing and toy design. One evening in 1890, Celia pointed to where Caesar sat and said, "You know, I could make him, in three pieces." She set to work with scissors and muslin, and soon had a cat form. Her sister-in-law Charity Smith, an artist, painted the blank muslin. Caesar became known as the “Ithaca Kitty” and was very popular across the United States. He was sold in major department stores and was at the 1893 Chicago World’s Fair. Even though Caesar had seven toes on each of his front paws, they thought that his extra toes didn’t look normal enough and did not add them to the stuffed kitty. Last year The History Center brought Caesar back and gave him all his toes since we are a community that celebrates diversity. He is again a polydactyl cat! Caesar, an urban cat, has already called attention to the City of Ithaca. He has now also become an ambassador for celebrating our county’s rural heritage. Caesar will be at the November 18 Celebrating Rural Heritage event and will continue to visit rural sites over the course of this next year and will certainly plan to attend next Fall’s celebrating rural heritage weekend. You can follow his adventures through social media using #IthacaKittyvisits. If you spot Caesar out and about, please take a picture of him to post (and be sure to use the hashtag). Caesar likes to be photographed in the City of Ithaca and in all of Tompkins County’s towns, hamlets, and villages.